A new effort is underway in Grand Rapids to directly respond to the ongoing harassment, intimidation, arrests and detention of immigrants by Immigration Customs Enforcement (ICE). There has been a rise in ICE arrests, detentions and deportations over the past few years. Recently, it was revealed that ICE officials are even admitting that they want to get regular quotas, according to a leaked memo. The most recent ICE raids in West Michigan took place in January, with over 90 arrests and the bulk of them for petty crimes and misdemeanors. 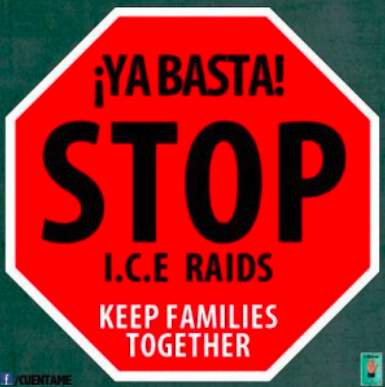 In response to the increased and ongoing ICE raids, a new effort is underway to provide a rapid response to the government targeting of immigrants and their families. The Rapids Response to ICE Network will provide social services resources and financial & legal assistance to those arrested, detained and facing deportation. There will also be a political response mechanism to try to pressure politicians and ICE officials to release those detained and facing deportation. To kick-off the campaign, there will be a march and rally this Friday at the Calder Plaza in downtown Grand Rapids. For more information, check out the Facebook event page.